In the Grassland Management Group, we aim to establish grassland management technology for the production of high quality forage and to develop labor saving grassland production and utilization system. We are also working on the evaluation of grassland ecosystem services. We are developing grassland improvement and management technology to sustain the stable supply of herbage with high protein content in orchardgrass (Dactylis glomerata L.) dominated grassland. Growth of orchardgrass is so vigorous that it often suppresses the growth of other herbage plants. We are attempting to introduce perennial ryegrass (Lolium perenne L.) and forage legumes into the targeting grassland, and observe the effects of early cutting on the stability of vegetation. 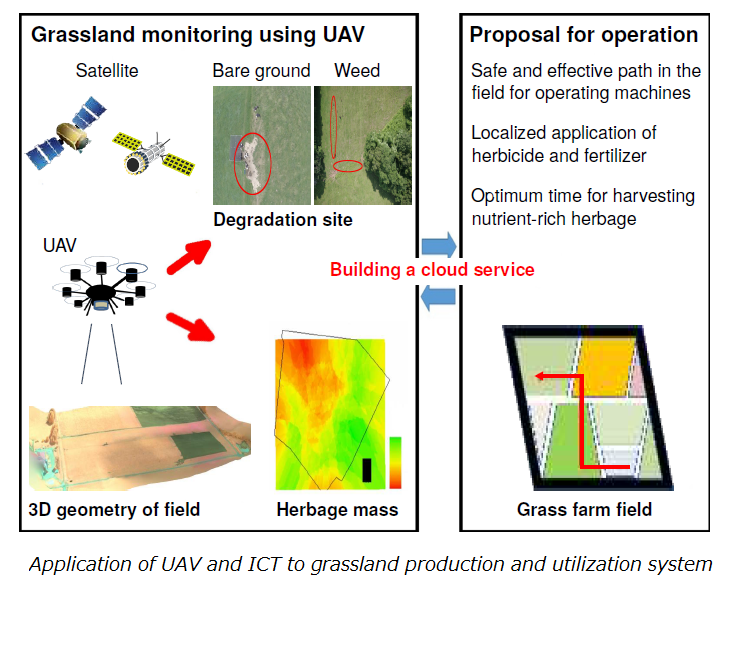 We are striving to apply Unmanned Aerial Vehicle (UAV, drone) and Information and Communication Technology (ICT) to grassland production and utilization for dairy production companies such as contractors. A surveillance system using the device and technology allows the labor saving in the grassland monitoring for the forage production. Frequent monitoring of the field using UAV is helpful and we can expect the optimum time that enables nutrient-rich herbage to be harvested. As research on the multifunctional aspects of grassland, we are working on the availability of pasture as honey plants' habitat for apiculture in summer. In addition, through the change of the plant species composition in semi-natural grassland, we also conduct research to evaluate the impacts on grassland ecosystem services.